"Berg Adventures provides a wide range of experiences and options that are well-balanced with time on your own as well as organized outings." Turkey’s highest mountain, Mount Ararat, standing at 16,854ft/5,137m, has long been a mountain of myth and intrigue. It lies in a region steeped in the rich history of the earliest human civilizations; from the shepherds who roamed the grassy plains to the world’s first farmers who began cultivating crops and on to centuries of battles by the Byzantines, Ottomans, Romans, Greek and Persians. The region has seen great change over thousands of years and yet, in many ways, life in Eastern Turkey has not changed much at all. As we climb up the mountain, we will walk with nomadic peoples herding their animals as their ancestors did thousands of years ago. Adding to the legacy of Mount Ararat is that, according to the Old Testament of the Bible, Noah’s Ark came to rest high on Ararat’s slopes. While you probably won’t find any remnants of an ark on the climb, you certainly will find adventure on this rustic and remote peak in Eastern Turkey! Mount Ararat is thought to be the place where Noah’s Ark came to rest. But climbing Mount Ararat won’t be our only objective – Turkey has so much more to offer! Our journey begins in Istanbul where we will visit some of most iconic sights including the Blue Mosque, the Hagia Sofia and the Grand Bazaar. This unforgettable city has so much to offer that we highly recommend you arrive a few days early to further explore. Read more about Things to Do in Istanbul. Top left: The iconic Blue Mosque of Istanbul; Top right: The Basilica Cistern in Istanbul; Bottom left: Some of the unique Turkish items for sale in the Grand Bazaar in Istanbull; Bottom right: The markets of Cappadocia are bursting with color, flavor and variety. Next we will travel onwards to the Cappadocia region of Turkey. The lunar landscape of Cappadocia is characterized by tall pinnacles of rock called “fairy chimneys” and other craggy rock features, both natural and manmade, that have made this distinct region one of a kind. We will explore Cappadocia by hiking through the valleys and by visiting the mysterious underground cities which served to protect the early residents from invading armies. There will also be an option to take a hot air balloon at sunrise – an experience that truly brings the breathtaking landscape to life. Left: Climbing into one of the ancient abodes of Cappadocia; Top right: Exploring the Kaymakli Underground City in Cappadocia; Bottom right: Looking out onto Cappadocia from inside the shadowy cave dwellings. Finally, we will travel to Doğubayazit where our five-day climb to the highest point in Turkey – Mount Ararat – will begin. 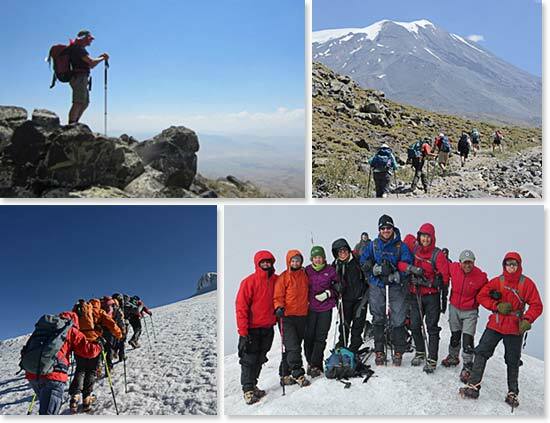 Top left: Taking in the surrounding beauty of the Turkish landscape from high on Ararat; Top right: Beginning the climb of Mount Ararat; Bottom left: Climbing to the Summit of Ararat; Bottom right: On the summit of Mount Ararat. View our previous Mount Ararat & Turkey trip dispatches. Good cardiovascular conditioning and strong hiking muscles will make your trip much more enjoyable. 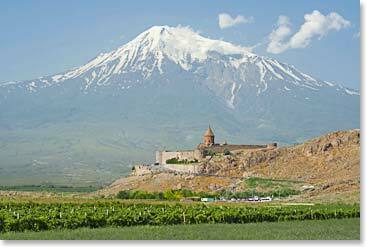 Our goal is to climb Mount Ararat at 16,854ft/5,137m. The climb is not technical, but we will be walking on snow and ice using crampons for the last 700ft/215m. Prior mountaineering experience is not required. Begin training today if you want to get the most from this trip.